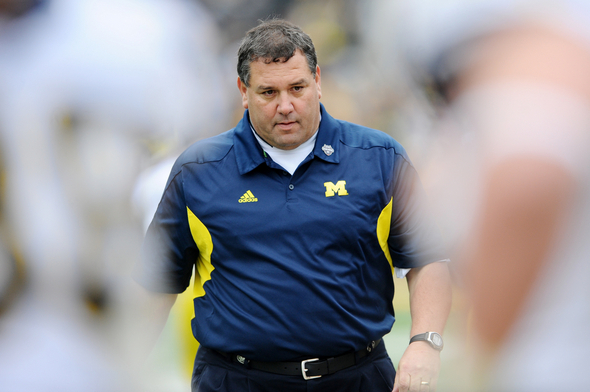 Posted on Tue, Apr 3, 2012 : 12:30 p.m.
Michigan coach Brady Hoke was named the Big Ten's Coach of the Year and Maxwell Club's Coach of the Year. Michigan football coach Brady Hoke still isn't quite comfortable with all the attention he has received after last season, including being named Big Ten Coach of the Year and the Maxwell Club's Coach of the Year. "Those are team awards, believe me," Hoke said in a video posted by MGoBlue.com. "We had a group of seniors who did a tremendous job. We had a group of underclassmen who came together and wanted to play as Team 132 together. "We've got a great staff. We got people in the equipment room who work hard for the kids. Our trainers, our managers, everybody. So truly, those are all team awards. "As great football coach once said, when he got an award, it was like a turtle on a fencepost. It didn't get there by itself." Now, though, Hoke's attention is turning to Team 133, which embarks on a more difficult schedule without a combined five starters from its offensive and defensive lines. But there are key returners, too, in left tackle Taylor Lewan and strong-side defensive end Craig Roh. There are several key returners elsewhere as well, including quarterback Denard Robinson, tailback Fitz Toussaint, linebacker Kenny Demens and the safety corps of Jordan Kovacs and Thomas Gordon. In the video, Hoke updates those guys' play in the first half of spring camp, and how they're handling increased expectations heading into the season opener against defending national champion Alabama on Sept. 1. Wed, Apr 4, 2012 : 3:45 a.m. Anyone notice that the offense is FINALLY passing out of the read option. That's good news. Something most of you, most likely would not be able to pick up on. If anyone has any questions regarding this or anything else concerning the program just leave it as a reply and I'm sure I can help you understand. Fri, Apr 6, 2012 : 1:14 p.m.
Gee, thanks. I'll do that--when I can think of something you might know of value. Ted, I had a tough day at the office but I gotta tell ya Ted when I read your post I got a good laugh, thanks Ted and go Blue ! Wed, Apr 4, 2012 : 4 a.m. Thanks Ted. BTW my screen-name also happens to be ted, which is kind of a weird coincidence. Although you have never heard from me, I have followed many of your posts. They give me great insight because you have such a great understanding of everything having to do with the game of football. When I looked at this video I did not notice that they were passing out of the read option. That was an amazing observation. I think most of what you say goes right over the head of most of the people on here. You truly are a very important and great man. Wed, Apr 4, 2012 : 3:54 a.m.
i am sure you and your father BIG FRAUD urban buyer will make us understand right tedly. Wed, Apr 4, 2012 : 12:27 a.m.
8-4 will be a successful season. The following year, nothing less than 10 wins will be acceptable. We are on our way back but not there yet. Wed, Apr 4, 2012 : 3:29 a.m. I expect them to get better. You must not be a Michigan fan. Tue, Apr 3, 2012 : 10:14 p.m. Given that Hoke &amp; Co. took the 108th place Wolverines to the top 20 last year, I think it's reasonable to believe Hoke &amp; Co. will at least manage to keep the Wolverines in the top 20 this year and make them contenders for the B1G title. Coach Hoke has been good at spotting weaknesses and implementing improvements. Every college team faces the same yearly roll over in personnel, so I don't think Michigan's coaches find it to be anymore difficult than any other aspect of the game. We should welcome roll over: after all, the team will have more of Hoke's recruits every year and we know they are quality recruits becoming standout Wolverines. I agree with Hailmary; even if Michigan loses to a top team like Alabama, it's instructive and a motivator. Of course winning the first game against a highly ranked team (and it will happen sooner than later) will boost Michigan's reputation tremendously. I really appreciate the boldness of Brandon and Hoke in taking on this great challenge. Hoke had nothing to do with it. The game was scheduled before he was hired. Nice try though. Tue, Apr 3, 2012 : 6:06 p.m.
Go Blue. Coach Hoke is great, does wonders for the team and the Michigan tradition. Tougher season ahead, but the Maize and Blue will prevail with great leadership and superb talent on the field. Tue, Apr 3, 2012 : 6:01 p.m.
Tue, Apr 3, 2012 : 5:12 p.m. I love Brady, as he is never afraid to give credit to other people. He is a true Michigan Man. I have to say that RR did nor leave the cupboard bare, but we lost some very good Seniors this year -- our most physical players. We have much tougher games in 2012: Alabama Improved ND on the road Nebraska on the road (MSU was killed there last season) OSU on the road And the annual brawl with MSU will be hyper intense in 2012. Well, at least Wiscy is still off of the schedule -- I would not want to travel to Madison. GO BLUE!! Tue, Apr 3, 2012 : 5:08 p.m. I like that game with Alabama, win or lose it's a positive for Michigan. If we win there will be no doubt that we can beat any team in the country if we're prepared. If we lose we come away knowing we can take anything any team we face dishes out and should we lose we know exactly what our strengths and weakness are in preparation for the remainder of the season. It's not exactly a good gauge of team strengths and weaknesses when you start your season beating up on cupcake teams. Thu, Apr 5, 2012 : 1:34 a.m.
Yeah rtmind cause the osu really throttled the rockets last yr right? Wed, Apr 4, 2012 : 11:26 p.m.
No rtmind, I mean like Michigan vs Alabama to open the 2012 season. Wed, Apr 4, 2012 : 1:35 p.m.
Hailmary, You mean cupcakes like Toledo and Appalacian State? Wed, Apr 4, 2012 : 7:53 a.m.
hey Wrongmind...you are confusing your school with The University of Michigan... See... Michigan has a 25-7-1 record vs. the SEC and your school....what is it something like 0-11 or something...oh yeah you did get a win vs. Arkansas... but ooop....! that one vanished like laser surgery on a Tattoo. ha ha. stay in ohio. Tue, Apr 3, 2012 : 11:37 p.m. Depends on how you see things Rtmind. Especially in football I think the theory that a positive can come from a negative holds true. In ohio's case we have a double negative in the case of having to give tress. the proverbial boot and then firing a loyal, dedicated, honest hardworking, popular coach that was a darn good athlete for ohio to replace him with a coach with a decent record but personal problems relating to his ability to handle the pressures of being a head coach. All this just to beat little ol Michigan Wolverines. Good lord rightmind you must have the utmost fear and respect for the Great Michigan Wolverines. Tue, Apr 3, 2012 : 10:43 p.m.
Well, wrongmind, I guess they shouldn't be out there practicing because look what happened to Woolfolk in practice, broken foot and missed a whole season. Let's just curl up into a coccoon. Tue, Apr 3, 2012 : 7:35 p.m.
rightmind, the talent differential between UM and Bama is not do great where we have to worry about Bama beating them up. UM is capable of giving as many hits as they take. I'll never fret physicality with Hoke at the helm. Tue, Apr 3, 2012 : 6:51 p.m.
What if UM gets beat by 4 touchdowns and Denard gets his leg broke? Is that good for Michigan too? I forgot to mention, the very nature of the Alabama vs Michigan game is a character builder for both teams. You might ask how it would benefit Alabama ? Isn't the win loss record 2-1 in favor of Michigan ? I agree that it is a great experience and will generate big time excitement. No one really knows how good Alabama ia this year, but I saw what they did to MSU 15 months ago -- it was awful. These SEC teams are totally different. I can only hope that Saban does NOT have the Crimson Tide ready to play!!! !